The USA's largest Marxist organisation, Democratic Socialists of America has consistently supported Barack Obama-particularly through its influential Chicago branch. But as Ronald Reagan famously said of the Ku Klux Klan "just because they support me, that doesn't mean I support them." While Obama has mixed with DSA members for many years, socially and politically, he has only occasionally been publicly identified with DSA sponsored events. Obama makes an apparent, if obscure reference to DSA in his 1995 autobiography "Dreams From My Father". "Cooper Union" is the Cooper Union for the Advancement of Science and Art, a privately funded college in Downtown Manhattan. For many years, from the early '80s until 2004, Cooper Union was the usual venue of the annual Socialist Scholars Conference-almost certainly what Obama was referring to. 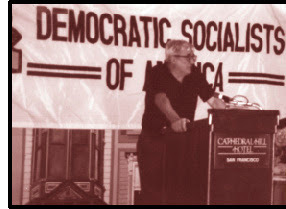 SSC was for many years the largest socialist gathering in the USA, attracting up to 2,000 participants. Bogdan Denitch, a Professor Emeritus at the City University of NY Graduate School Program in Sociology, has been Chair of the yearly Socialist Scholars Conference in NY since 1980. He is an Honorary Chair of the Democratic Socialists of America (DSA) and its representative to the Socialist International. Since DSA's formation in 1982 its City University branch has sponsored and organised the Socialist Scholars Conference. The bulk of SSC's organising committee were DSA members, as were many conference speakers. SSC was no love-in for aging hippies and peace loving "democratic" socialists. Speakers often included members of the Communist Party USA and its offshoot, the Committees of Correspondence, as well as Maoists, Trotsyists, black radicals, gay activists and radical feminists. Barack Obama speaks of "conferences" plural, indicating his attendance was not the result of accident or youthful curiosity. In 1983 obama moved to Chicago to work as a community organisor. He was inspired by Harold Washington the city's new mayor, a longtime associate of the Communist Party and Chicago's socialist community. Chicago socialist dinner, 1981. Left Carl Marx Shier, ex Socialist Party, future leader of Chicago DSA. Centre Egidio Clemente-ex? Socialist Party USA. Right Democratic Party congressman and future Mayor Harold Washington. In 1988 Obama left Chicago to study at Harvard Law School. He returned in 1992 and in 1996 he ran for Illinois State Senate with the endorsement of DSA. That endorsement was partially earned by Obama's performance at a DSA sponsored forum held at Chicago University in early 1996. Over three hundred people attended the first of two Town Meetings on Economic Insecurity on February 25 in Ida Noyes Hall at the University of Chicago. Entitled "Employment and Survival in Urban America", the meeting was sponsored by the UofC DSA Youth Section, Chicago DSA and University Democrats. The panelists were Toni Preckwinkle, Alderman of Chicago's 4th Ward; Barack Obama, candidate for the 13th Illinois Senate District; Professor William Julius Wilson, Center for the Study of Urban Inequality at the University of Chicago; Professor Michael Dawson, University of Chicago; and Professor Joseph Schwartz, Temple University and a member of DSA's National Political Committee. Toni Preckwinkle and William Julius Wison (voted one of the 25 most influential people in the USA in 1996)have links to DSA. Michael Dawson has been a leader of the DSA and Communist Party infiltrated Black Radical Congress. Barack Bbama's flirtation with DSA seems to have begun in the early '80s and may continue to this day. Wow, I am flabbergasted by this. I'm sure majority of Americans have no idea of this particular history of Obama. Hi, I just happened across this article on Google when I searched for Obama. There's only one thing I think you should correct: the DSA is not a "Marxist" organization. I'm sure there are Marxist members, but most DSA members believe in some variation of Keynsianism and European social democracy. Not exactly "Marxist." To call this organization "Marxist" is a bit misleading. I can understand the mistake, but if you're trying to say that Obama is some kind of Marxist, I think you need to do your research. You might want to look up who Obama's economic advisers are, as I'm sure you'll be surprised. So McCarthyism is alive and well even in New Zealand!!!!! I am a native Chicagoan, trade unionist and Obama supporter. 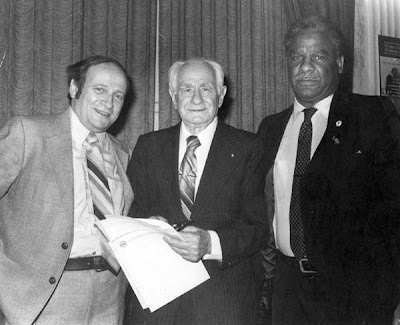 Carl Shier, whom I knew for some years while he was a United Auto Workers representative, was basically a Tony Benn type democratic socialist and a real fighter for working people. Barack Obama's connection to DSA and so on was distant at best....illustrative of his willingness to search for broad common ground even with those he didn't always agree with, a willingness attested to by his Republican colleagues in Springfield. At any rate, your thinking that an occasional rubbing of elbows with the intellectual and political brethren of EV Debs, Olaf Palme, Willy Brant, Jean Juares, Bruno Kreisky etc. is somehow a bad thing is less a comment on Obama than on you. Obama was a full member of the 'New Party' - which did define itself as a Marxist group. It will be curious to see what happens when Obama is in office. I'm sure that the 'party line' votes will continue though. Hi, I was wondering if anyone knew how to look up last nights commments as I only see 4 comments today. I was looking for Heather?